When coming up with this week's menu on Sunday Matt said he wanted to try making gyros at home. I imagined this would be a little complicated but was pleasantly surprised at how easy Alton Brown's recipe was, no harder than making meatloaf (actually easier than our favorite meatloaf). Does it taste like a gyro you get out that's cooked on a spit? Not exactly, but it was still really tasty. This recipe makes a lot of meat, enough for 6 to 8 servings. We halved it since it was just for 2 & it seemed to work just fine. The biggest difference is the loaf won't be a thick but since you are just slicing it and putting it in a pita is doesn't really matter. Preheat oven to 325. Process the onion in a food processor for 10 to 15 seconds. Put it into a tea towel and squeeze out as much juice as you can. Return the onion to the food processor and add the remaining ingredients. Process until a fine paste is formed. Place the mixture into a loaf pan, spreading it into all the corners. Put the pan into a water bathe & bake until the mixture reaches between 165 & 170, should be about an hour. Remove from the oven & drain off any excess fat. Place a brick covered in foil on top of the meat (we used another loaf pan filled with canned goods for weight) and let sit for 15 - 20 minutes. 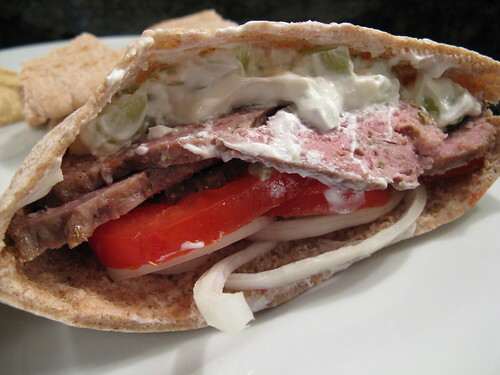 Slice and serve on pita with tzatziki sauce, onions & tomatoes. You can also cook this on a rotisserie. See Alton Brown's recipe for details on that. Place the chopped cucumber in a tea owl & squeeze to remove the liquid. In a medium bowl combine the drain yogurt, cucumber and all remaining ingredients. Can be stored up to a week in the refrigerator in an airtight container. I'm glad you actually got to take a picture of your gyro. Mine didn't make it. Looks good, my friend. Looks good. Aren't these just too delicious? I am not very much into meat, IF we eat Gyros or Turkish Döner Kebap I usually have the “veggie” version which is mostly with Feta instead of meat, but your Tzatziki with mint sounds great. I love that combination of yoghurt and mint sauces with mediterranian dishes. Have you ever tried a drink made of yoghurt, some mint and salt and then fill up with sparkling water? So refreshing on hot summer days and ideal if you cooked too spicy. I love gyros but have never tried to make the meat filling myself, but this version sounds doable! YUM!!! I finally got around to making these and they are WONDERFUL!!! I'd love to include this on my humble little recipe blog with the dairy-free version of the sauce... do you mind if I copy the recipe and link back to you?